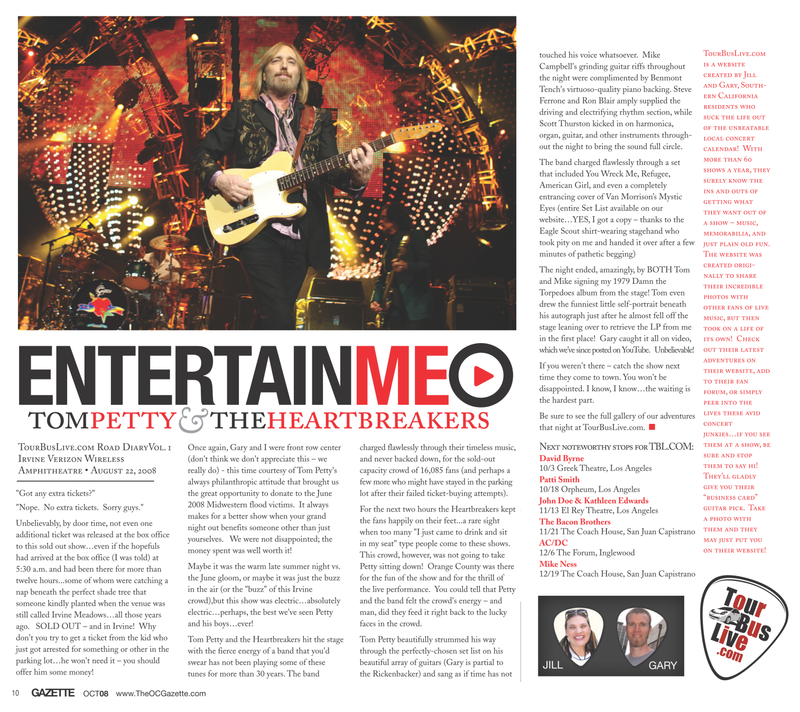 Exploiting an enviable catalogue of three and four-chord timeless masterpieces, Tom Petty and the Heartbreakers performed to a nearly sold-out show at the Palace of Auburn Hills in Auburn Hills, Michigan. Armed with his traditional Rickenbacker guitar run through a row of Vox Super Beatle amps, Petty had fans easily chiming in on his iconic repertoire of classic hits, including "Free Fallin'," "American Girl," "You Wreck Me," "Mary Jane's Last Dance" and "Refugee." Didn't someone once sing that the waiting is the hardest part? When we last saw Tom Petty, the legend was rocking the Super Bowl with a halftime performance that left us wanting more. Thankfully, all that ends on July 3 when Petty hits the stage at the Verizon Wireless Music Center with the Heartbreakers, his longtime band. Expect to hear cuts from his 2006 solo album, Highway Companion, sprinkled with crowd-pleasures "Free Fallin'," "I Won't Back Down," "Runnin' Down a Dream," and of course, "The Waiting." 7:30 p.m. $29 to $94.50. 12880 E. 146th St. Noblesville. 776-8181, livenation.com. "Nope. No extra tickets. Sorry guys." Unbelievably, by door time, not even one additional ticket was released at the box office to this sold out show ... even if the hopefuls had arrived at the box office (I was told) at 5:30 a.m., and had been there for more than twelve hours ... some of whom were catching a nap beneath the perfect shade tree that someone kindly planted when the venue was still called Irvine Meadows ... all those years ago. SOLD OUT -- and in Irvine! Why don't you try to get a ticket from the kid who just got arrested for something or other in the parking lot ... he won't need it -- you should offer him some money! In 2008, Tom Petty reunited with his former band, Mudcrutch. The Mudcrutch story has been an oft-fabled one, being Tom Petty’s first musical endeavor that built a following in the south in 1970s but somehow escaped making a record. Their self-titled debut, although about 35 years late, takes the listener back to the heart of American southern-rock in the seventies. “Scare Easy” is classic Petty, a rollicking single that features the songwriter at his most gritty, while “Crystal River” sounds like guitarist Mike Campbell filtered the soul of Duane Allman through his liquid slide guitar playing. Petty’s songwriting has not seemed this laid back in years. After the introspective, solemn Highway Companion in 2006, it seems like the bearded old-hippie is finally having fun. Mudcrutch, Mudcrutch Reprise: When legendary rocker Tom Petty wanted to return to his roots, he asked the surviving members of his original band Mudcrutch to team up with his current band Heartbreakers. Result: this hi-energy classic. In the Land of the Free and Home of the Brave, there's never a shortage of songs criticizing or praising this here fine country. So here's just a few tunes -- in no particular order -- you should put on rotate to celebrate (or not) your independence this month. Released a year after American's 200th birthday and covered by so many artists, this hit was inspired by the cars speeding on the freeway outside of Petty's apartment (not suicide, as it's rumored). He considered people who are longing for something more in life, or better than they already have. In the land of the free, where we are encouraged to chase our dreams, such a song is appropriate for this list. And on a side note, the song was recorded by the band on the Fourth of July. New box set collects three decades of shows including covers, rarities. 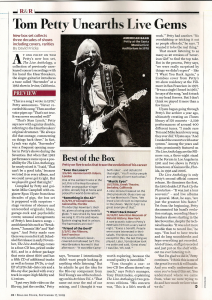 At one point on Tom Petty's new box set, The Live Anthology, a collection of previously unreleased concert recordings with his band the Heartbreakers, the singer-guitarist introduces a tune called "Surrender" at a 1983 show in Irvine, California. "This is a song I wrote in 1976," Petty announces. "Never recorded this song." Then another voice pipes up: "That's not true. It was never recorded well!" Editor's Note: That last article is better read in the magazine itself. In preparation for writing this issue's cover story, I had the enviable task of spending an afternoon in a New York City recording studio with Benmont Tench. Huddled beside a vintage Hammond A-100 organ and a Wurlitzer 200A, Benmont showed me some of his trademark fills and flourishes that have become such an integral part of the rock keyboard pantheon. He graciously let me into his tonal toolkit, showing me drawbar stops and piano parts to venerable hits like "Refugee," "Breakdown," and many more. 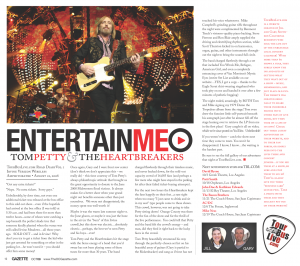 Tom Petty on growing up as a hippie in redneck Florida, the early days of the Heartbreakers and the stories behind his biggest hits. "It's a strange thing to say out loud, but I felt destined to do this," Tom Petty says in a grainy baritone with a slow Dixie drawl. "From a very young age, I felt this was going to happen to me." The singer-guitarist and leader of Tom Petty and the Heartbreakers is sitting in the small lounge of a guesthouse at his home in Malibu, California, on a hilltop across the road from the Pacific Ocean. The walls are decorated with Heartbreakers concert posters and, near the front door, a framed charcoal drawing by Petty's friend Bob Dylan. Two rooms away, Petty has a fully rigged studio where he did a lot of work on The Live Anthology, a new multi-CD collection of concert performances by Petty and the Heartbreakers, drawn from three decades of roadwork.